This relaxed panther was sighted near gate 7 late in February. 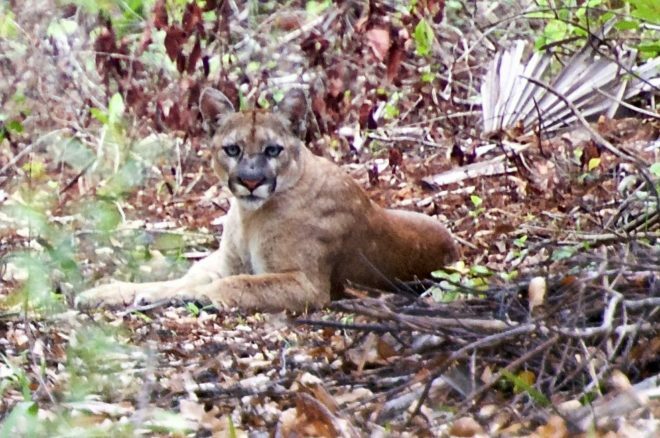 Editor’s note: Lee Gerig and Carole Jodouin of Ottawa, Canada provided the Friends of Fakahatchee with a photo and report of their recent panther sighting in the Fakahatchee. “On Saturday 24 Feb 2018, my wife and I decided to walk one of the trails in the Fakahatchee. Our initial plan was to walk from gate 12 to the “Fakahatchee Hilton” as we have done that walk before and really enjoyed it. Just after we entered the park and paid our admission fee, we encountered a volunteer who suggested we should try walking from the gate 7 and head toward the south tram trail – hopefully we might see some orchids. On our way, we encountered the park biologist Mike Owen and his wife who were looking at snakes. We stopped and chatted with them for about an hour and received an impressive flora/fauna lesson from them – really an enjoyable and educational experience.